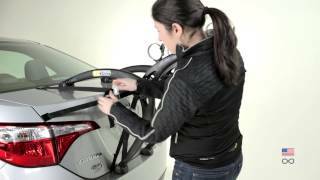 More than just a car rack, the Saris Bones 3 Bike Rack is a statement of style. Whether you have a hankering for the lonely highway, wicked single-track or unexplored backroads, here′s the rack for you. The easy-to-install, bone-solid, fun-to-look-at Bones rack. With a three-bike capacity and non-marking resin construction, you′ll be on the road and wandering in no time. The Saris Bones has soft adjustable feet that will protect your car against jolts and bumps while in transit, suitable for different contours of all types of car/van/4X4. Includes Integrated straps to hold and stabilize bikes on 3 different levels. The Saris Bones has become a legendary cycle carrier, where its function is as well engineered as its form. Easy to install, easy to use, and most importantly takes care of both the car and the bikes during transport.